Updating "My ancestor was born ... where?!" In September of 2014, I wrote a blog posted entitled “My ancestor was born … where? !” about my family’s unexpected ties to Saint Helena, a remote volcanic island in the South Atlantic Ocean. My great-great-great-grandmother, Charlotte (Sears) Legg, was born on the island of Saint Helena in 1808. She married Henry William Legg, and after his death, settled on Martha’s Vineyard with her children. This discovery fascinated me, and since then, I have resolved to learn more about Charlotte and her family. But ultimately, I hoped to learn why my ancestors had settled in such a far-flung locale. Were they soldiers of the British military or members of the East India Company? Sailors who tired of the sea? Or did they simply settle here seeking a better life? 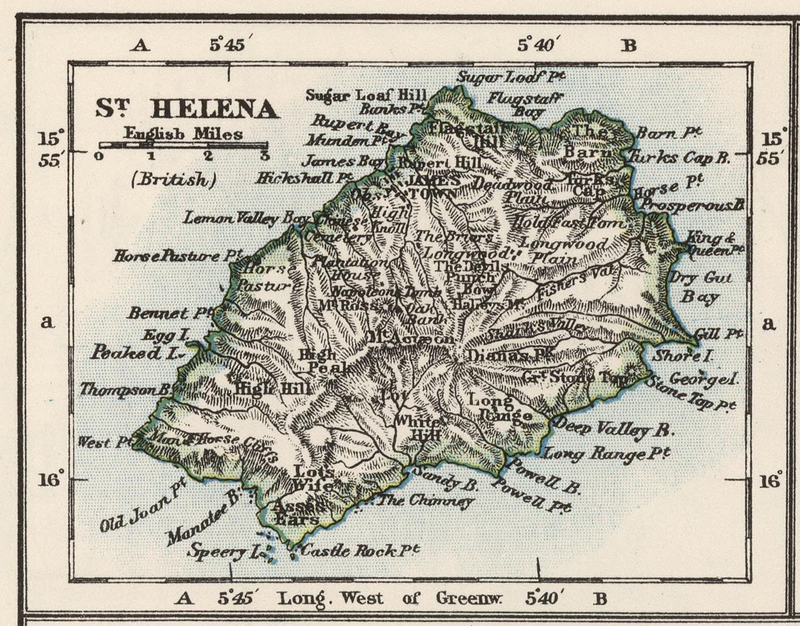 Because of its remote location, I had low expectations for records pertaining to Saint Helena. But I was pleasantly surprised: a varied collection of records has survived, which includes a collection of Saint Helena church records from 1767 until 1835. These records are available on Findmypast and the British Library has also transcribed miscellaneous records as a part of their India Office Records collection. Between these two sources, I was able to uncover more about these ancestors. I learned that Charlotte was born 13 December 1808 and baptized at Saint Helena 8 September 1816. She was listed as the illegitimate daughter of Gabriel Sears and Elizabeth Day, and she married Henry William Legg at Saint Helena 27 August 1822. I was surprised to learn that she was listed as illegitimate, but shocked to discover that she had married at the age of thirteen. The India Office Records collection also included information on Charlotte’s husband. Henry William Legg was born at Saint Helena 5 November 1799 to John and Emily Legg. The Leggs proved a little easier to trace, as I was able to learn that John Legg and Amelia Knipe had married at Saint Helena 17 January 1799. Years later, at the time of John Legg’s death in 1829, he was listed as a publican or tavern keeper. Though these records have shed a little more light on Charlotte and others, they only provide a few details about their lives. The ultimate question – Why were they at Saint Helena in the first place? – is still elusive and will require some more digging. Fortunately, there are more records that might provide answers. But, for now, these Saint Helena ancestors remain a tantalizing part of my family tree, and another item on my lengthy genealogy to-do list. Wow. What a tantalizing mystery! I’m at one of those points of frustration in my own research, so I love hearing about other people’s challenges and how they are dealing with them. Looking forward to installment #3! I know I’ll learn something– if only how to extend persistence. How about the birth entry just above Charlotte’s? It reads, as well as I can decipher it, “Richard Thomas Son of Thos Churtey (sp?) & Maria Slave to Mr Canole (sp?) Illeg’te.” I have never seen such a birth so openly recorded in American records, have you? Quite interesting and a good find, Saint Helena is definitely beyond the usual research locations. Unfortunately, there isn’t a Legg surname study at the Guild of One Name Studies, but the name is fairly common in England, (I’m researching Legg ancestors in Surrey, and there is a notation of Samuel Legg’s tomb at the Granary Burying Ground in Boston). Well done. I have that problem with my Great Grandmother. My family is in the Capital District of New York and she was born in the Southern Tier of NY for no reason that I have ever found. One thing that I do know is that a lot of Italians came to NY when the Capitol was being built because there was a need for stone carvers. So one needs to know what was going on in the “foreign” area at the time that might have drawn the prospective mother (and family) there. What a super find. I am, as are many, looking for that one spot in our ancestry that will release its clues. Congratulations. I can almost feel the excitement in your soul! ON why your g-g-g-grandmother resettled in Massachusetts from St. Helena, any possible connection with whaling? The whaling ships of New England circled the globe in the early and mid-1800s. Perhaps there is some connection to her emigrating to Martha’s Vineyard. As to US records being so open about illegitimacy, in some times and places, they were. My ggg grandmother in Schenectady listed in her New Testament, which I have, the 1798 birth of a daughter, with no surname. I knew she’d married in 1803, and I knew all the children of that marriage. I wondered if perhaps she’d been previously widowed and I just didn’t know it. So I posted a query on the Rootsweb Dutch-Colonies list, since the family were Dutch in background. 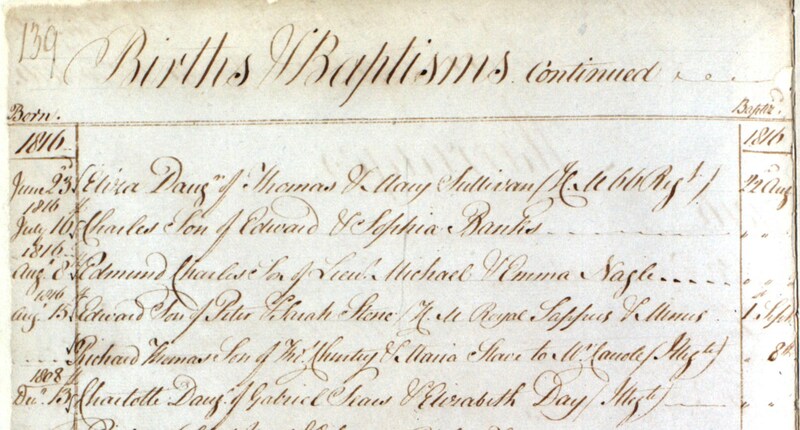 Someone on that list had access to Dutch Reform Church baptismal records. With the date of birth I provided, and the first name, they found a baptismal record including the mother’s name, the child’s name, sponsors’ names–and a father’s name. The father’s name was listed upside down. I was told that during that time period, the Dutch Reform Church used that as a “code” to denote an illegitimate birth. The person who found this record for me also had access to an 1800 list of adult residents of Schenectady. There were several men with the same name as the listed father. Only one had a mother whose name was that of the baptized child. During this time period, the tradition of naming first born daughters after the paternal grandmother was still very strong. So the person who’d researched this for me, a highly respected registered genealogist, concluded she’d found the father of this particular illegitimate child. Once I learned to find such records for myself in a genealogy library, I saw additional baptismal records with the father’s name upside down. Not many, but enough to convince me that the custom did exist. 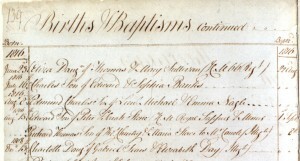 At the time, New York didn’t keep civil records of births, so church records of baptisms are the best substitute we have. Sorry, pad not working well. Book tells history of settlement on St. Helenas. I’m not sure how much further you’ve got with your ancestry research since this post, but I have quite a lot of information about some of the people you mention, especially about the Knipe family, from which Amelia was descended. 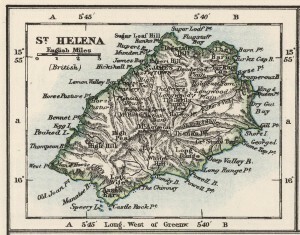 St Helena was originally a refreshment station for the East India Company and John Knipe was one of the very early British settlers, being born in England ca 1660 and dying on St Helena in ca 1695 (his will is dated 1695). Amelia was born in 1778, the daughter of Samuel Knipe and Amelia Bagley. Samuel was the grandson of the original John, I believe. (Your Amelia’s brother John was one of my ancestors, so you and I are distantly related!). Amelia married John Legg in 1799. He was a widower, previously married to Ann Harper in 1783. He was a cabinet maker and was born in 1758 (so was 20 years older than Amelia) and died ca 1829. His parents were John Legg (again)and Mary Moulton, married in 1754. John and Amelia Legg had 8 children, with Henry William Legg, the eldest, born in 1799 and died 1853. Amelia eventually kept a tavern (she got a licence to do that in 1835) and she died in 1854. Not sure if any of this is new to you, but if you’d like to know any more, feel free to contact me on jane.amanda.scott@gmail.com. I have been researching my families St Helena connection and recently found my great grandfathers half sister Harriet had a daughter also Harriet. She may have married William Napoleon Legg and gone to Massachusetts with their son. I’ve found the travel records of William, Harriet and son travelling from U.K. to USA IN 1903 along with half cousins Martha and Mary Mark, my great grandfather James Murray’s half sisters. Curiously William Legg was already married in Tisbury but he takes his new family back there. His wife says she is married to him in 1881 but later says she is divorced. I have some more info but you might already know most of this. I have a copy of a letter written by August Mark, stepfather to my great grandfather where he mentions both mother Harriet and daughter Harriet.